At the Crestone, CO training in June 2011, the Trifield meters (aka magnetometer) were going off and giving signals from individuals sitting around the circle, especially from the heart chakra. When I got up from my chair, people were still getting signals from my heart chakra position of the empty chair. I got a message from the ETs that everyone in the group was to take a turn sitting in the chair and merge with the trans-dimensional ET that was sitting there. Dr. Greer stated that we did not have time for this, but Doug Parker actually did do it during the snack/pee break, and reports on his experience below. These devices ( http://www.trifield.com/content/trifield-meter/ ) detect electro-magnetic signals, and are intended to detect excess EM radiation from microwave ovens and other home appliances. At the Crestone site we were about 100 feet from the electricity wires, and all people are directed to turn off their cell phones, etc. On the first night, the signals came from heart chakra positions of three women on one side of the circle. The woman in the middle of the group was undergoing a kundalini awakening, reporting that she was experiencing celestial vision for the first time in her life (i.e. she would close her eyes but was still able to see everything). The next night the signals came from three men on the opposite side of the circle. Doug and Warren were two of the men. In the email below, Doug is asking Warren to report any experience that he had. Emery Smith apparently got an amazing photo of an energy form hovering above Warren while this was happening. These meter signals were the first objective confirmation I had of being merged with an ET. Previously, I had thought it was “just my imagination”. After this training, I began to actively invite ETs to merge with me and it was at that first extraordinary meeting with the group in Lumby (August 2011), when I got the message that people could walk into the center of the group and merge with an ET. Six people did so, and the entire group felt the energy when they successfully merged. When people began meeting for ET contact in my living room in Jan 2012, we understood that anyone experiencing extreme shivering coldness, likely had an ET close to them who was ready to merge. Several people got warm when they agreed to merge. In Marco island (Florida) I asked Dr. Greer about this and he stated that the reason for the coldness was that when the trans-dimensional technology is very near to your body it is sucking energy out of the quantum vacuum. Once you agree to merge you are now ‘surrounded’ by the technology and so you no longer feel the cold. Doug Parker himself was on the beach later that night when the temperature was approximately 75 degrees F. he approached me and said he was shivering with cold. I told him that an Et was ready to merge him and if he did so he would warm up. He merged and gave me the thumbs up that it had worked. For ET contact groups this is not a trivial point. Some people actually preach that merging is dangerous to do. In August 2012, I was at ECETI ranch in Trout Lake Washington, attending a Neil Kramer workshop with about 50 of his followers in attendance. Kramer is articulate, entertaining and a joy to listen to but there was not a lot of new information for me. At the end of it, during the Q&A, I asked about merging with ETs. Kramer interrupted my question, became obviously frightened and immediately warned people against doing it, because it was difficult to know ‘what’ you were merging with. My only thought to his response was, “Oh brother, here I am am again … with beginners.” I have been merging with ETs for several years now and have never experienced a problem. One person in my photo of the 12 foot Arcturan reported being merged with 10 ET beings at that moment. My first introduction to having another person’s consciousness inside one’s own mind were the shamanistic writings of anthropologist Hank Wesselman (i.e. Spiritwalker, Medicinemaker and Visionseeker). I highly recommend these books if you want to understand more. Doug Parker from New Zealand here. I have been keen to contact you since we were at Crestone, and Deb sent me your email. I realise you have been to more of these events than I have, but for me, Crestone was the most amazing week of my life! I will start by describing to you from my perspective a couple of things. When Trudy saw an energy ball in front of LeeAnn & Deb, Dr Greer took over a magnetometer, which as you know started to respond with a series of 3 squeals [or pulsing beeps]. I was so drawn to that, that as soon as there was a break I went over and asked Deb if I could sit in her chair. Funnily, she said to me that was what she had been ASKED to arrange, by the ET’s. So I sat down and proceeded to get some “lessons”. Bill [the Stanford Dr] brought over his magnetometer, and it beeped when placed in front of my chest, 3 times. Then it sqauwked oddly, then produced 5 beeps. For some reason I was then strongly attracted to the idea of interacting with it. I did a chakra opening sequence, from the base to the crown and drew in “Earth energy” in a way I had learned years ago from a book on healing, spiralling this anti-clockwise upwards through my body. As I did this the trifield meter went crazy and Bill asked me what I was doing. I told him but I was trying to go deeper and speaking was not easy. Then I drew Cosmic light energy down through my crown chakra, spiralling clockwise – so a kind of “energy Merkaba”, a concept I had only learned about during that week. The meter went even wilder! As you know very well, the following night, Trudy saw an energy vortex over your head, you were sitting next to me with Deb to your left and Ricky to my right. So, for the only time that week our car team was seated right in a row, and Deb had been involved the previous night – no coincidence we were either side of you. Emery took an AMAZING photo of the energy over you and we could all see a being inside the vortex. If you have not seen this photo, you really should! My involvement from this point is as follows. The meter responded in front of you, very strongly, with three beeps. In front of me and Deb, it did so very weakly, almost silent. My lessons from the previous night came to me instantly and I felt I needed to be involved, so I shut my eyes and quickly went back into the same state as the previous night. The next time Dr Greer put the meter in front of me – it pulsed much more strongly, so I immediately knew I was making progress. I gave myself over to this as completely as I could, and started to feel a vibration and a deeply emotional state develop. I felt I should be enhancing this energy/event, and passing it to the group, so I attempted to do that, counter-clockwise. Dr Greer became slightly strange – his voice changed and he said “Vector open. Open vector strongly” He said this in a very insistent way and did not sound his normal self. Later he told us that this was in part, the ET’s speaking through him – and I really feel that is correct. So I felt confirmation that they knew what I was trying to do [strengthen the efforts they were making, whatever those were or were for]. So, that was my part of the experience, and it was incredibly intense for me. I was really trying to emotionally connect, and offer myself in the deepest service. I have tried some experiments with my own meter back home. It does not simply do these things on it’s own, but I have managed to get a small response when I was in a very joyful energetic state and I want to learn more. I will totally understand if you do not wish to share your perspective of that night, but I know if was focused on you and I am certainly curious about how it felt for you or what messages you may have taken from this. One other event that I did not share with the group, as it seemed entirely personal. Late in the week, at the morning meditation, my Great Aunt came through to me. She died in 1982 and I do not encounter her very often. She was as clear as day, and she handed to me a very pointy crystal! I had no idea what this was about, so said nothing to the group. That evening, we arrived early as usual at the site, and I went directly to Shari’s tree. Emery arrived early too, and came over. We were the only people at the tree. He seemed a little “shy”, and he proceeded to open a pocket and tell me that he had something for me. He drew out a small, pointy quartz crystal – and told me it was very special. It had travellled with him to lots of CSETI events and would connect me with those when I took it home. He said to me that he was asked to give it to me, and also that he did not do this sort of thing lightly, or very often. Boom! Right there I had absolute confirmation that the meditation was a real event, a connection! I told Emery, and he was also stunned. Of course, he has this type of experience quite often so it is nothing new, but it is amazing and really capped off a terrific week of growth for me. I plan to go to other events, meanwhile I am trying to build up my small group here in NZ doing CE V’s. I have had some contact since I returned home, but what I want to do and to learn about is all connected with the events of those two nights that I described above, That is where the rubber hits the road. I hope you are well Warren, and I may see you again! Bless you and bless Gaia and the work we are doing. 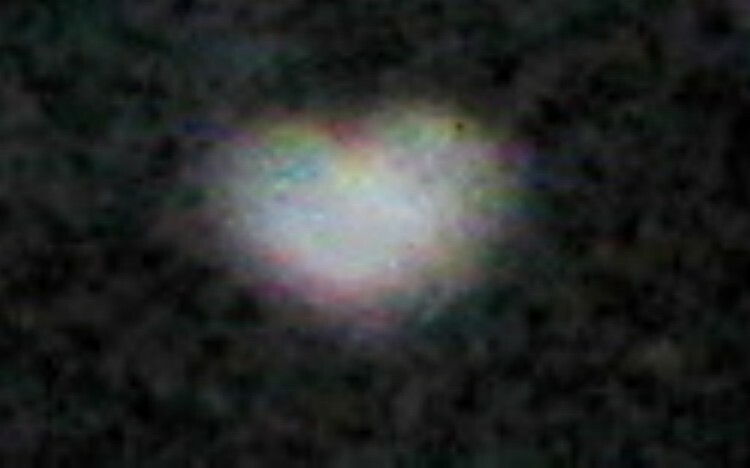 Karen took these pictures a few days after our Sept 25th CSETI ET Contact at Gardom Lake … one heart shaped orb … the first I have ever seen as well. Somehow it feels good just to look at it … like Dr. Greer says, “… the image is holding the ‘darshan’ of love.” Thank you Karen. I was out on my balcony talking to the trees and taking photos tonight. It’s hard to mistake the shape of the bright little orb in this photo. Enjoy! I didn’t tell the whole story regarding the heart orb. I was on my balcony talking to the trees and telling them how much I loved and appreciated them. I began pleading with the tree spirits to help the trees prepare for what was coming…. as a developer has bought the property right in front of my balcony and is beginning a strata development there. I became very emotional, with tears streaming, as I told the trees how sad I was to know that they might be taken away. I also asked Spirit to help the developer to spare as many of the trees as possible. After my emotional chat with the trees and spirits is when I began to take photos. To me the Heart Orb told me that the trees and Mother Earth had heard me and sent me love back. The Heart also told me that everything was and would be okay. I thanked the trees and spirits and mother earth and told them how grateful I was for such a wonderous, beautiful present. I was beaming from ear to ear. So a couple of days later the big machinery and chain saws arrived. Although I was saddened to see many trees fall, they were all on the other side of the property and my little grove is safe for now. The developer is starting on the other side of the property…yahoo. It may be another year or two before they start work on this side of the property… or if the units they build don’t sell because of the market… my dear trees could be safe for a long long time. So that’s the story of my heart orb… and how it helped save the trees in front of my balcony. Finally, I have a moment to respond to this email. Sorry for the delay. I love reading your messages. Have not had time to process the Shasta photos yet, but will send you copies sometime in October? Yes, the Aug 29th was mostly female, I think there were five guys out of 16 people … and at least two lesbians. I think the CSETI trainings don’t necessarily need to be gender-balanced … they are “unfortunately” skewed in favour of those who can afford the fee … I think a ‘pure’ heart is the main requirement, difficult to achieve when you are still plugged into corporate/capitalist culture. I accept that the CSETI trainings are Greer’s show and he is running them, though I do think he needs some help in leading them. I have seen him run out steam on a couple of occasions and I do think he needs someone to step in at these moments. My work at the college is very easy but now very busy, but have taken on some extra tasks, and then decided to sit-in on an AutoCAD course for 10 hours a week (for fun!)…. and then of course there are always cello practice, gardening, and housecleaning blah, blah blah. then another ET contact event Sunday night with a new group of people. At the Wise Women festival I facilitated impromptu ET Contact Friday and Saturday night… I will write up in more detail and forward to you (and Deb Foch) but here is the gist of it…. we were out on a dock on Okanagan Lake (9:30-11:30 pm). Me and four newbies each night. A different group on each night. Each group seemed to get the giggles and begin laughing uncontrollably, this was followed later by the onset of extreme coldness even though the air temp was not unusually cold (for Canada at this time of year). Yet, on each night, one person observed a light dancing around the sky for two hours. Right angle turns, counter clockwise, zoom in close then zoom out. Only one person saw this, and it was the first time in their life they had ever seen anything like this–they were very distraught and disappointed that no one else was seeing it. I emphasized that the rest of us were to celebrate this as a personal initiation for ‘light-observer’, we should all try to honour this person’s experience. We should also work at avoiding feeling like one person observing the lights meant that the rest of us were “losing-out’ in some way. The others seemed to understand and succeeded in doing this. On Friday night, one woman reported that she went out of body, travelled onto a ship and helped to navigate it around then returned to her body. She is now middle aged and had only experienced this once when she was 10 years old. There was quite a gale blowing, and we could see trees on the beach bending in the wind and hear the wind blowing all around us…significantly there was only a light breeze passing over us for most of the evening… like an ET craft was surrounding us. Occasionally it would move away and let us feel the full force of the wind. I explained to the group that we could invite the ET craft back in to protect us from the wind, and it did so each time. Everyone in the group acknowledged this. Mostly people lay on the dock, stared up the sky and felt overwhelming peace and calm…they simply basked in it. On Saturday night, another newbie was the “light observer” and again she watched the light move for about 2 hours. 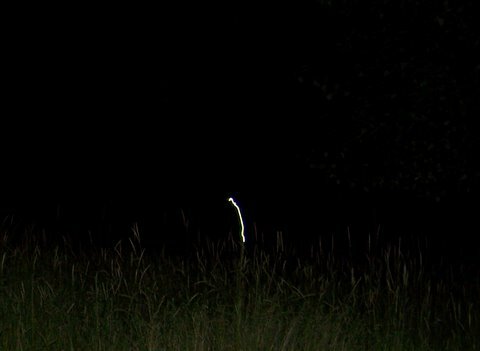 This person had a major sighting of a lightship years ago while she was grooming a ski hill in the middle of the night. Again the group was directed to think about this as a personal initiation for this woman and that we should all try to celebrate her experience. Her best friend reported seeing ‘shadow people’ all the time, and had seen an outline a tall ET in the ‘light-observer’s’ summer cabin on one occasion. On Saturday night, the best friend, in her mind’s eye she saw a pinkish, flesh coloured ET walking up the doc (with the shape of a typical Gray ET, big head, big eyes, but taller about 5 to 6 feet tall, not wearing any clothes), she assumed it was her imagination and when the being was half way up the dock she opened her eyes, did not see anything and yet knew that it was still approaching us and came to stand only 2 feet away from the group. She then ‘knew’ that it lifted up and flew over the water back to the beach, where it re-joined a group of shy ETs in the bushes (i.e. new species meeting humans for the first time?). Then the three of us hear a loud vocal sound ” EEK, EEK, EEK…”. We three sat up and began discussing the sound. The other two girls were dozing off as they basked in the peaceful calm energy that we had created…they heard nothing. A cat attacking a bird at 10:30 at night? I offered this as an explanation. The ‘best friend’ said, “No, it was an ET speaking.” And then she heard the magnetometer signal as confirmation of the truth of her statement, she then began getting a telepathic transmission from the ET on the beach explaining the following….he was demonstrating how to approach humans and reassuring the others that our group was safe to contact. The other ETs were too shy to approach. Significantly, she reported that the being was ‘real ballsy in the way he walked’, as in he walked with a quick confident swagger as he approached us on the dock… our group immediately began referring to him as “Ballsy-Eek”. Earlier I had answered questions about referring to ETs with names that were meaningful to humans (i.e. Kindness, Bijoo, Patience and Lore). She continued to observe them on the beach with her ‘inner knowingness’. Then we all heard another strange sounded like a …. duck purring? More ET vocal sounds? Eventually, the four newbies were overtaken by the coldness in their bodies, even though they were wrapped in blankets and sleeping bags….I explained that it was not the physical cold of the air temperature but that ETs often work on a person’s energies and this is often experienced as bone-chilling cold. I was perfectly comfortable. Two of the newbies were shivering and so I said it was time to go. As we walking away through the park, the ‘light-observer’ felt an energy presence. We all stopped, gave the ETs a final goodbye. 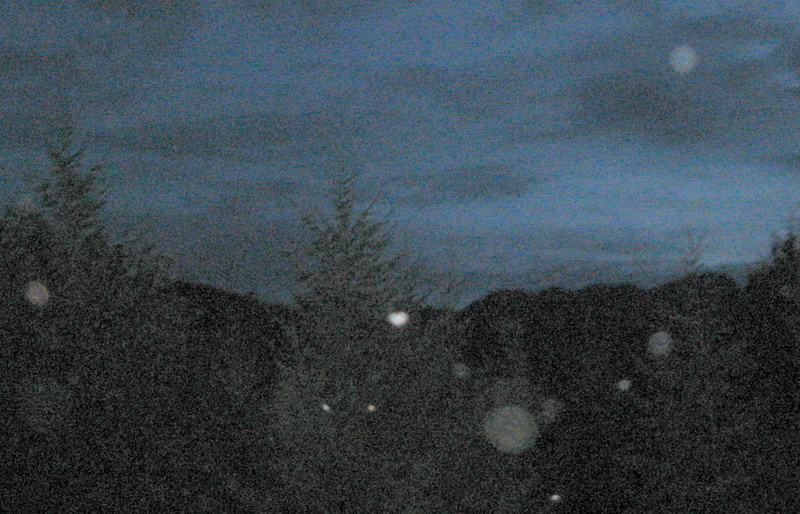 Photos were taken that recorded the ‘light-observer’ being surrounded by orbs. The ‘light-observer’ and her best friend were quite wired by the experience and could not go to sleep immediately. They stayed awake for hours and drove around in their car, discussing their experiences. They continued to sense the presence of ETs where ever they drove. They next day they reported that they had both received healings for long term pain. Pain had disappeared from one woman’s foot, the other no longer had a chronic back pain. Both young women were seeking advice on the next step…I could only emphasize: meditation! meditation! meditation! Telling each of them that they needed to get calm with the experience and meditation was the best way to do so. Vernon, B.C. Canada: a group of 8 people two groups each in different locations: one a group of 5 people and at the other location 3 people. Group 1: 5 people ….7:00 – 9:20 pm The air had been very still, then as soon as we opened the circle by honoring the earth and the elementals with an offering of tobacco, this great gale of wind started up bending the trees, the wind continued for the rest of the night whistling thru the trees but our group felt only a slight breeze while a trans-dimensional ship protected us, occasionally it moved off so that we experienced the full force of the wind, but it always came back in response to our requests. As one member of our group had a sore throat and laryngitis, she viewed this as a sign to offer her own throat for channeling. She then connected with an ET group, and channeled a brief message about “The Christos Light” from a communal group of ETs who showed her rainbow light showering down on their eggs. The word YES came through very loud, I felt the full force of her voice when she spoke. These ETs eventually directed us to put our crystals in the center of the circle, they would have preferred pointy quartz crystals. Their energy then spiraled down toward the crystals. She invited us to ask questions and we only received answers when the answer was YES, otherwise there was silence, afterward she reported that she was not able to form questions herself but could only respond to questions that we asked. She saw a bright vertical shaft of light (about the width of one inch at arm’s length) in the south, then a few seconds later a very bright light shoot downward from the sky in the south south west….tuning in, she confirmed that both lights were ET related. She was extremely excited about seeing this. During the meditation, she was on an ET craft but went through a crystal hallway, where she felt her body being cleansed and cleared, this took some time, and when it was over she found herself was waiting beside a pulsating light, then she heard me ending the mediation and she followed the return to Earth. Throughout the evening everyone in the group observed several instances of subtle light flashing briefly, lighting up the surrounding area. Toward the end of the evening, one flash revealed a dome of light that was over-top of us. Another woman took numerous orb pictures (with a flash), the very first picture was 3 orbs forming a CSETI equilateral triangle. 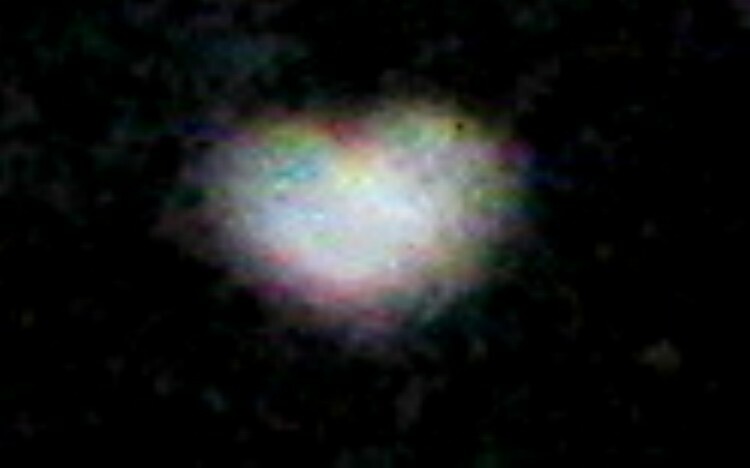 One orb with a “Happy Panda Face” was recorded, also the outline of a cat face was apparent in the background outlines near the orb. I saw brief flashes of lights between us and the surrounding trees. When I finished leading the meditation, I opened my eyes and saw three pinpoints of red lights in a vertical line between the trees about 100 feet away. After the mediation, two woman reported feeling extra-ordinary love for the planet and the diversity of life on the planet, one woman saw all the enlightened humans a sparkles of hearts rising up off the planet. In general, everyone felt peace and calm, just enjoying the being outside on a windy night. I was traveling from Shasta CSETI Training on Aug 27th but would like to file this report for Mon Aug 29th because so much happened. Since last May I planned to meet with this new group of people on Mon Aug 29th and give my introductory CSETI presentation and then do a skywatch. This was a very experienced group of alternative healers and they meditate all the time as part of their regular practice…they were a very coherent group of people. The moderator of the group sent an invitation to all that stated: “Only come to this event if you believe that ALL ETs are benevolent. If you believe in bad ETs then do not come to this event as you will ruin the experience for the rest of us.” This is more assertive than I would normally be, in any case 16 people attended including myself. I started with my usual presentation: playing the crop circle sounds, showing the DVD with light on the beach in Outer banks in April 2009, playing the Orion transmissions, showing the CSETI photo of the Andromedan, etc. As soon as I took out the Trifield magnetometer, it started going off and people who could see energies saw the beings in the middle of our circle. The meter mapped a specific area where they were present and then would go silent in all the other areas. The meter signals corresponded to exactly where the energies were observed, in fact I was directed by the people observing the energies to move to specific areas where the energies were observed and the magnetometer signal would get much stronger. Several people succeeded in mapping the exact same area with this same meter. We then moved outside immediately to begin the skywatch, or more accurately the circle-watch, as it was clear that the ETs were already present. People started getting messages from the ETs “Why are you moving, we are here?” Silly humans we wanted to be outside to look at the sky as well … sigh. One of the leaders of the group reported getting a video image of an ET-energy as we left the building (her camera had recorded the pulsing energies of the first ET presence). Within minutes the ETs succeeded in re-establishing their trans-dimensional portal in the middle of our new circle outside under the sky. And once again, people who could see energies were observing their presence. I suggested the leader of the group create coherency in the group by leading a meditation. She stated that we needed to be more grounded, and immediately led into a grounding exercise that spiraled our consciousness into the earth. When she finished we were all more calm. I then insisted that we all listen while one person spoke. On several occasions I had to direct people to stop their individual conversations and direct their attention to focus on the group consciousness. Everyone was very earnest in their desire to do this, no one seemed frustrated or angered by my request. After about 40 minutes of listening to individual reports, I suggested that anyone who was willing should approach and try to merge with the ETs in the middle of the circle. About 6 people (of 16) tried this and succeeded. Once they made the connection we would all feel the love. It was extraordinary. One person was directed to move to the left 6 inches, because they were not completely aligned with the trans-dimensional portal. As soon as he was in alignment, everyone in the group felt the love flow. This event was best experience of ET contact for me so far. All were loving connections with the ETs. Having attended 7 CSETI trainings, this is what I have been waiting for. Dr. Greer maintains that the constant monitoring of him creates a barrier, preventing us from have a rich experience of ET contact–best to start up our own groups at home. Plus this most recent CSETI training at Shasta really drove home the point: mediation! meditation! meditation! While my regular group of 5 people just seem happy to sit out under the stars and talk about ETs, this new group is very disciplined about meditating all the time as part of their regular healing practice, and what a difference it made for me. the magnetometer going off continuously as it sat upon my knee. the magnetometer signaling at the heart chakra for about 8 people but not the others. two people entered a very deep trance where they felt healing was being done, one person needed assistance in walking to her vehicle at the end of the event. three people mapping the area with magnetometer and getting consistent signals. This group of people obviously doesn’t need any further help from me for them to establish ET contact but I let them know I would be delighted to join them at anytime in the future. Kosta usually requests a report of the results for the Global CE 5 …. I have written an example. Let me know if you approve of the report and feel free to change anything. I have used your initials C.S., feel free to change this as well. On the previous Sunday afternoon, I met with my friend, C.S, to discuss ET contact issues and show her the magnetometer app on my new Android phone, after about an hour it became clear that we had both gotten ‘messages’ to do the protocols that very afternoon, and so we went to our contact site. When C.S. felt the presence of ETs, the magnetometer pulsed perceptibly, the horses in the field across from us suddenly became agitated, running to another area of the field. In addition, a coyote gave up tracking some deer and ran out of the field. C.S. had just asked the ETs for a ‘sign’, asking them to “make the horses move when the ET craft arrived”. We were inside the car because it was cold outside, at one point C.S opened the door and detected the smell of an unusual floral fragrance (it is still winter here in Canada, so no natural source of flower smell at this time of year). After about, 1.5 hours, C.S. saw the outline of two ET beings walk directly in front of our car (about 12 inches from the car). During this time, I mostly felt a loving connection to the ETs, accompanied by some energetic effects (i.e. my body temperature rose) as if I was receiving a ‘download’. Eventually we got the sense that the encounter had concluded and so we left. As I was driving away I began discussing the Global CE 5 event, and at the same time C.S. got a high pitched ringing sound in her ear. She said this was confirmation that we were supposed to follow up on the Global CE 5 event. We agreed to do this on Friday March 4, because this date fit our schedules. On Friday March 4th, we arrived at the contact site around 7:30 pm, and observed that the magnetometer was pulsing. We both had a sense that the ETs had already arrived. This contact site is on a country road which is on a hill above the lake. Only three other vehicles were observed on the road during the time we were there. In addition, three commercial jet aircraft flew at low altitude directly above us. These would have been the only sources of moving-light in our field of view. Throughout the encounter, C.S. observed scintillating pinpoints of light in the field on the right side of the car. I saw a few pinpoints of light on one occasion in the same field. About 30 minutes after we arrived, C.S. observed an orange light that pulsed horizontally, 75 feet in front of the car about 15 feet up in the air. About one hour later I saw light reflect off a golden metal surface in the same area (about 1 foot in height, and 2-3 feet across). There was no conventional source of moving-light at that point because a low hanging cloud had fogged us in, and sleet/snow was falling. Again, I mostly felt a loving connection with the ETs throughout the event. I found this easy to achieve when listening to Dr. Greer’s meditation CD. Due to concern over driving conditions we left around 9:30 pm.